Most Owners Want An Obedient Dog! Most owners don’t want an Obedience champion for a dog. They simply want their dog to come when they call. Or sit when they say “Sit.” And to settle down and be calm. Most Owners Want A Dog That Is Easy To Deal With. Most owners want a dog that is easy to deal with. Doesn’t chew or mess up in the house. No digging. Or biting. Or excessive barking. No destructiveness. And one that gets along with people and other dogs. Sometimes It’s Not That Simple. Unfortunately, life with our pet dogs is not always that simple. When Fido is not so easy, then we say he has “issues.” Behavior problems. And he’s in need of some Behavior Modification. That’s where we come in. Behavior problems are our specialty. We Work With All Types Of Behavior Problems. We’ve worked with dogs that bite both people and other dogs. We’ve worked with dogs that are afraid of noises, or people, or skateboards, or almost anything. We see nervous and hyperactive dogs. Dogs with house training issues and dogs with separation anxiety. We work with impolite dogs that jump on people. And counters. The Bloodhound Who Turned On The Stove Is One Of My Faves! One of my favorite cases was The Bloodhound who turned the gas stove on! This story is so indicative of what we do. On the surface, it appeared to be a simple counter-surfing problem. But it was so much more. Their House Could Have Burned Down! A couple came home one day to find a burner on their gas stove on. Having no concrete evidence, they still suspected their 8 month-old Bloodhound. Several weeks later they had the answer. This Dog Had CRAZY Energy! In a fit of energy, the dog ran through the house. She crashed into a chest of drawers. She continued the rampage down the hall and then back into the living room. She jumped on the furniture. All the while her owners were yelling at her to “STOP!” Which wound her up even more. They Figured Out How She Did It. She then dashed into the kitchen, jumped up on the counter and ran down the length of it. She leaped to the counter on the other side of the room. As she ran down it and out of the kitchen, the last thing her back paw hit was the burner control on the gas stove. That’s when they called their vet, who then called me. Many Times Solving Behavior Problems Is Not About Corrections. Solving behavior problems in dogs is usually not about corrections. And it is not as simple as stopping unwanted behavior. Dogs left to their own devices are usually pretty well adjusted. The Human Interaction With Dogs Is Where The Problem Usually Occurs. It’s when humans and dogs interact that problems begin. What we do is get to the cause of the problem. Then we can create a solution that works. When I got to the house the bloodhound was jumping at the door. She wasn’t trying to do me harm. She wanted to play. But she also weighed over 80lbs. And she was intense with her jumping. So intense that it took me at least 30 seconds to get in the door. There’s Always More Going On Than What You See! On the surface, the problem appeared to be her unruliness. Crazy behavior! But there was a lot more going on. This Couple Actually Reinforced The Problem! When Your Dog Is In Charge, You Have A Problem! They Saw It And Now We Can Solve It. My statement, “you serve her” resonated with them. The wife said, “That’s exactly what we do!” Once that was out on the table the tension left the room. NOW we were moving to the solution! They Understood It Was About Them. You see it wasn’t about a dog that turned on the gas stove at all. Once this couple understood that this was about them, not the dog, things changed. Immediately We Started Getting Control Back. Their dog began to have a new place on the organizational chart. No longer was she the center of attention. And they got her the exercise she needed. And stopped rewarding the behavior they wanted to stop. The Humans Are Now In Charge. And NOW corrections were effective. When this couple said, “No” or “Stop”, it was now coming from leaders, not “servers.” As a result, dog craziness stopped. Counter surfing stopped. The Cost Of Behavior Problems Is Huge. Our lives are so busy today that if Fido has issues, it sometimes can be a real problem. For example, a dog that bites a human today can be labeled a dangerous dog in court. The cost of insurance after that is high. Unaffordable in many cases. And as a result, the dog is put down. We Train People And We Help Dogs To Behave Better. K9 Behavior problems are not always so tragic. Sometimes the answer is simple and the solution quick. Maybe the dog just needs some structure. And the owner needs some training to be able to provide that. We say we help dogs by training people. Lack Of Exercise Causes Many K9 Behavior Problems. Behavior problems are usually caused by a combination of situations. First, a lack of proper exercise. Dogs that are wound up are more likely to misbehave. Lack Of Leadership Goes Hand-In-Hand With Lack Of Exercise. Second, a lack of leadership on the part of owners. When the owner is not the clear leader and a dog has no structure, behavior problems result. Most Owners Are Not Aware Of Their Role In The Problem. Third, most owner’s reinforce their dog’s misbehavior. And they have no clue they are doing it! Nala The American Pit Bull Terrier With “Over The Top” Energy! Nala has more energy than 6 normal dogs combined! When you meet Nala, she gets so excited that she immediately starts to jump. And she can’t control that energy. Nala Actually Endangered Herself With All Of This Energy. Nala’s owner called me when Nala ran out of the front door into the street. No amount of calling or yelling at her could get her back. This type of thing happened often. My client told me that Nala once jumped out of the car and jumped into another person’s car. This was in a shopping center parking lot! She Had Too Much Energy And Not Enough Leadership From Her Owner. Clearly, Nala paid no attention to her owner. It would be easy to correct her behavior and assume everything would work out. But Nala’s owner did not have a leadership position in the relationship. But before that, Nala was too wound up to respond to anything. A Polite Walk Was What She Needed. I took Nala for a Polite walk and then brought her back. We walked for an hour. A Polite walk is more tiring to a dog then going out for a run! Once She Was Tired Then She Could Listen. We Teach The Dog Then We Teach You! Before the walk, this would not have been possible. My next job was to teach her owner how to get leadership back. That’s the biggest part of my job. Teaching people. The dogs are usually easy! We Ask A Lot Of Questions To Get To The Answer That Works For You And Your Dog. When we work with you we ask a lot of questions. We first determine the cause of the problem. Then we develop the fix. Sometimes The Answer Is Not A Correction. Too many times folks in our business think the answer or the fix to a behavior problem is simply a correction. If a correction is needed it must be the right correction. And it must be humane. And sometimes a correction is the last thing that’s needed. The Wrong Correction Causes More Problems. Inappropriate corrections cause more problems. For example, one of the most common housetraining complaints usually involves an owner who thinks his dog is dumb. And Most Of The Time The Answer Is Simpler Than You Think! We know to ask one simple question after that statement: “Have you ever rubbed his nose in a mess?” The answer is always “yes.” “He’s scared to go near you!” The cause is simple. The fix is more complex. We Get To Know You And Your Dog. We Are Your Partner. So when you work with us, expect to be questioned about circumstances. We want to know what was happening when the dog misbehaved. We want to know how long the misbehavior has been going on. We want to know how many people in your home interact with the dog. And We Get An Accurate Picture So We Can Get To The Bottom Of It! We want to get an accurate picture of what’s been going on. What we find is that in most cases human owners have helped create their dog’s problems. Often a behavior problem in the dog is created or reinforced by a lack of leadership from the owner. Our job is to help the dog with training and retraining and behavioral modification. We also help owners to see how to change their behaviors. Dogs Are Usually Easy To Work With. You have a 50/50 chance to change another person’s mind in a disagreement. To effect change in dogs, many times all you need is to change your behavior. Often that’s all it takes. We’ll show you quickly in a simple and easy way, what changes you need to make. And we start working with your dog immediately to modify behavior. Behavioral Modification Takes Consistent Work. We can get results quickly, but this is not a 30 minute TV show. Behavioral modification that changes problem behavior will require consistent work. We work with your dog, changing behavior. And we will give you the plan and the program that you need going forward to effect lasting change. To get started, fill out our intake form and let us know what’s going on with your dog’s behavior. We’ll get back to you as soon as possible and set up a no-cost Strategy/Discovery Session. We’ll First Do A No-Cost Discovery Session. 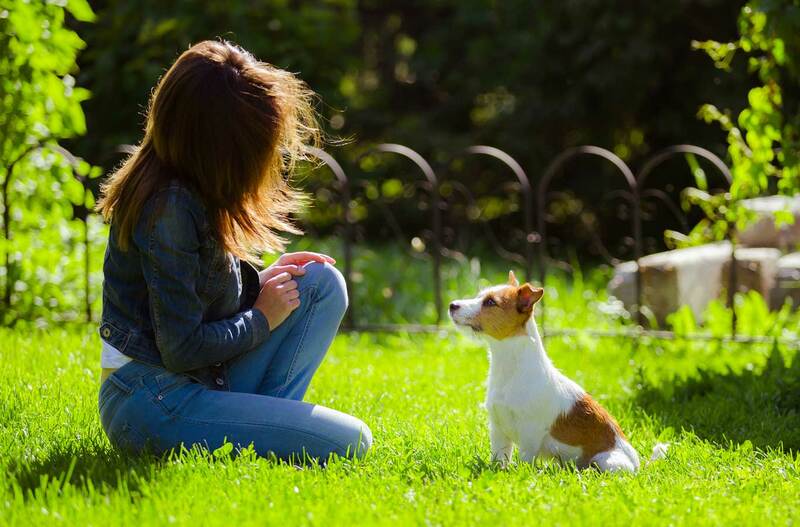 In this session, we will determine your dog’s “issues.” And gather some key information about circumstances and environment.We’ll also gather information about the human component. Who interacts with your dog. And how. And the frequency. We Make An Assessment And A Recommendation. We’re good at assessing the situation right over the phone and determining how we can help. And we’ll make a recommendation. Understanding, Modifying And Moving Forward. Creating a change in problem dog behavior takes compassion and understanding. Simply correcting a “bad dog” is ineffective and may times damaging. We’ll help you understand what’s going on with your dog. Then we’ll modify her behavior. And create the program for you to follow going forward. It’s Gratifying Work To Change Your Dog’s Behavior For The Good! It will be fun to enjoy your dog again. Or for the first time. We are honored to help you and your dog!